Bison cows and calves stay together in a herd. The Great Salt Lake is world famous. In elementary school I could proudly locate home on the globe by finding the only little blue dot in the western United States. These people are braver than I am. Brown patches on the beach are drifts of dead insects. International tourists want to see the lake, and are probably disappointed when they do, though not as disappointed as the tourism boards that occasionally want to turn the lake into a major attraction. I think the two times I have swum in the lake were the result of tourism improvements and promotions. Big loads of clean, white, sand were trucked in to the beaches, picnic areas were spruced up, so we went. But cosmetics don't change the ecosystem of the lake. Both times, my sisters and I were thoroughly grossed-out by the dead brine-flies washed up in black lines on the shore and the living brine shrimp wriggling inside our suits. All of the little black dots are brine flies. They make a good lunch for seagulls. The seagulls weren't romantic either because they don't stick to the lake. They are as easily seen in every park and playground of northern Utah. In fact, seagulls are less beloved than pigeons. They are noisy eaters-of-garbage and poopers-on-everything. 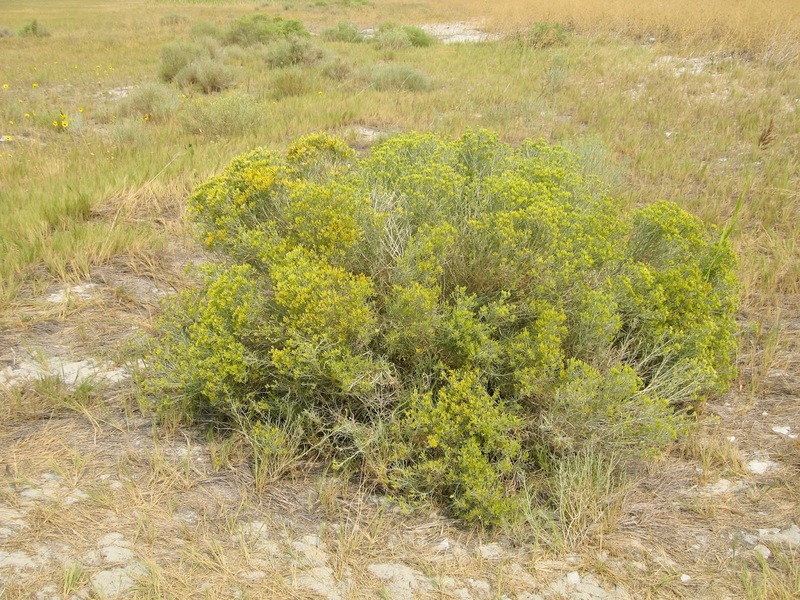 Another unappealing aspect is the smell, a rotten-egg, rotting vegetation odor that often overwhelms anyone near the lake and sometimes travels hundreds of miles away when the wind is just right. Saltair is the name of a lakeside resort that only seems to thrive for short periods of time. One reason for failure may be a name that reminds us of lake smell. I stopped swimming in the Great Salt Lake, but I never stopped returning. For two consecutive years in the early 2000's, I ran half-marathons that crossed the causeway to Antelope Island. Though a faithful jogger at the time, I had no business running either race--I really wasn't fit enough, but Runner's World made long races sound exciting. They aren't. But there is a real appeal in slowing down and really experiencing a place that is usually a blur out the car window. I never recovered from the second race. The perpetual pain and exhaustion was eventually diagnosed as rheumatoid arthritis. Towns and big mountains on the other end of the causeway are obscured by smoke. A few days ago, my sons and I went back to Antelope Island State Park in an attempt to satisfy my craving for big water. 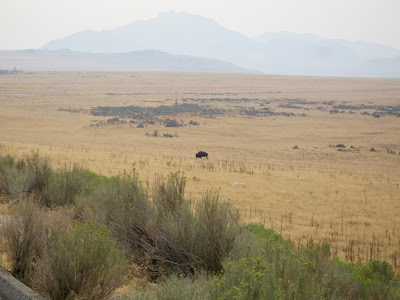 Due to fires all over the west, our air was smoky and long views were hazy or obscured completely. As we drove onto the causeway, there was a feeling of entering a different world. Reaching the water was my first priority, but it required a hike. Lake levels fluctuate greatly, so all of the infrastructure is on very high ground. At this time of year, the lake is low. 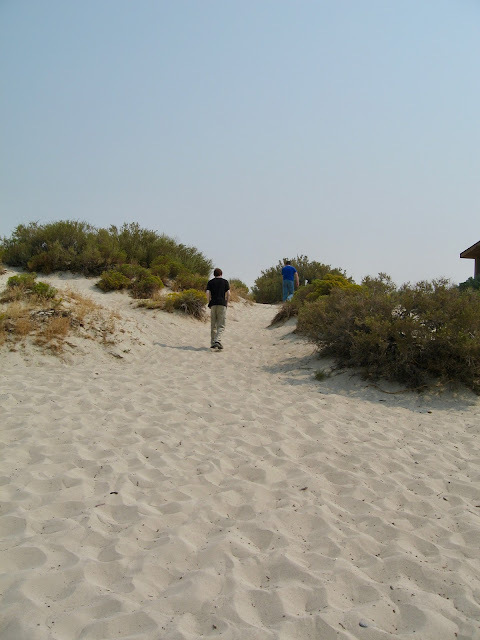 We walked over dunes and through salt grass before finally reaching the edge. Sadly, it was just as I remembered. Horse flies nibbled on our backs as we walked. 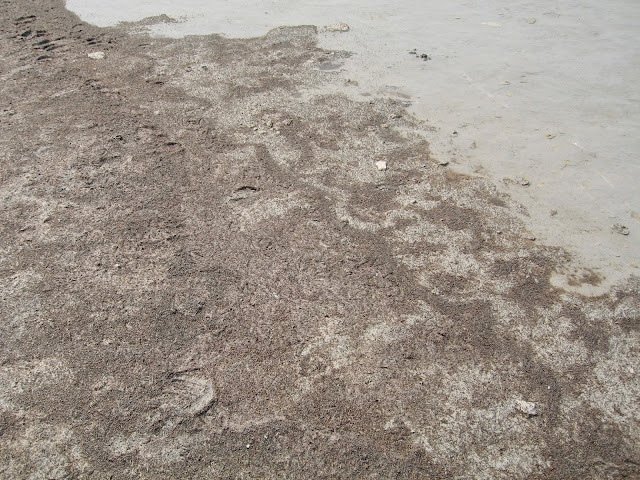 Swarms of brine flies moved in waves in front of our feet. All the dark brown is flies, living and otherwise. One of the constant sounds is the hum from millions of tiny wings. Part of me wanted to join the brave souls who came to swim. I really admired the two girls in bikinis who actually laid their towels on the beach and acted like they were at the ocean. But for the most part I was just as happy to be in long pants and tennis shoes. I couldn't bring myself to step past the bug line and into the equally buggy first bit of water. Old age has turned me into a total wimp. Avocets fly away from stalkers. Seagulls don't care. 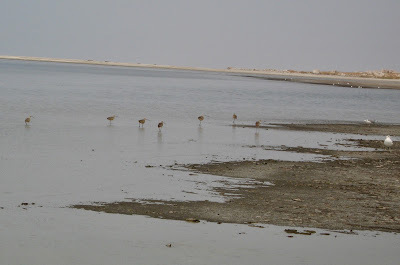 So we admired the insects for a while and I tried to get close enough to the non-seagull water birds to figure out what they were. Once the likely avocets flew away, there was little else to do but walk back to the car. That was my challenge for the day. Downhill, I had gravity and desire on my side. Uphill was all heat and slow sand. I stopped often to take nature pictures as an excuse to catch my breath. The darker grey under the grey sky is the water. This picture is taken from the beginning of our hike to the beach. This sandy hill was definitely a challenge. 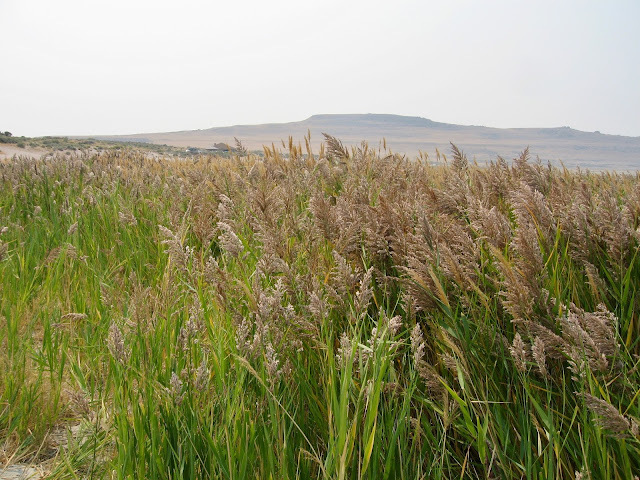 This grass makes a whispering sound in the wind. there are lots of birds and animals around the lake. But many are nocturnal and most are quite elusive. So we didn't see any antelope, mule deer, coyotes, or burrowing owls. There was a flock of about a dozen pelicans flying in a V formation. 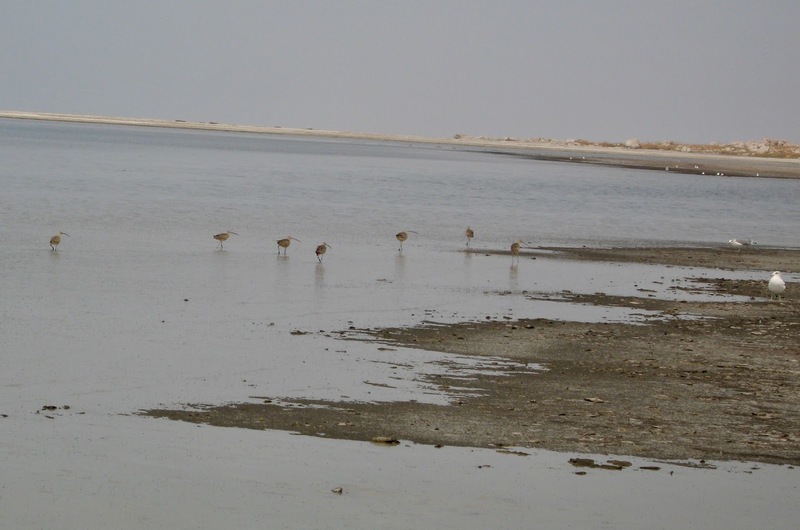 Pelicans can be found on several Utah lakes, but seeing these ocean birds in this inland desert always surprises me. This bull was on visitor center duty. The one type of animal that is hard to miss on the island is bison. In 1893, a dozen bison were brought to Antelope Island as part of an effort to save the species. Now there is a well-maintained herd that ranges from 500-700 animals. We are neither brave nor stupid and my camera is cheap, so we never got close enough for really good pictures. Gas was running low and time was running out, so it was time to go home. It was nice to have a little adventure, but it was not enough. Just like each visit I've had to the ocean was not enough. The Great Salt Lake is a hard world to enter. 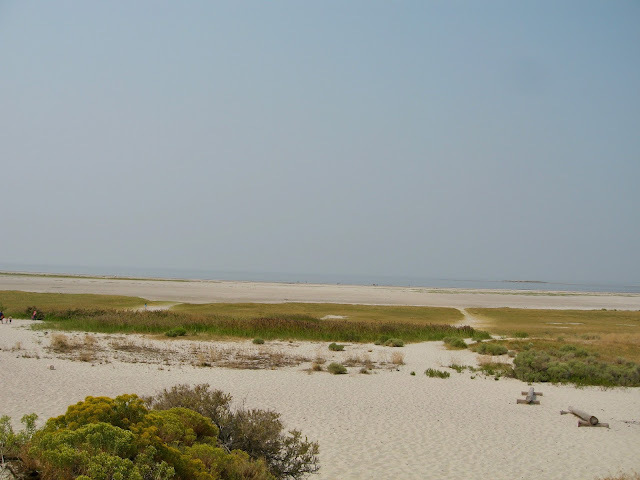 Surrounded by salt flats and marshes, there are only a few points of access, despite the lakes vast size. Only a few scientists and sailboat enthusiasts really get to know the lake well. For most of us, only a very limited view is available. The lake remains a foreign place. This shrub is named snake weed, but I hope it is sheltering lizards instead. They left footprints all over the dunes. 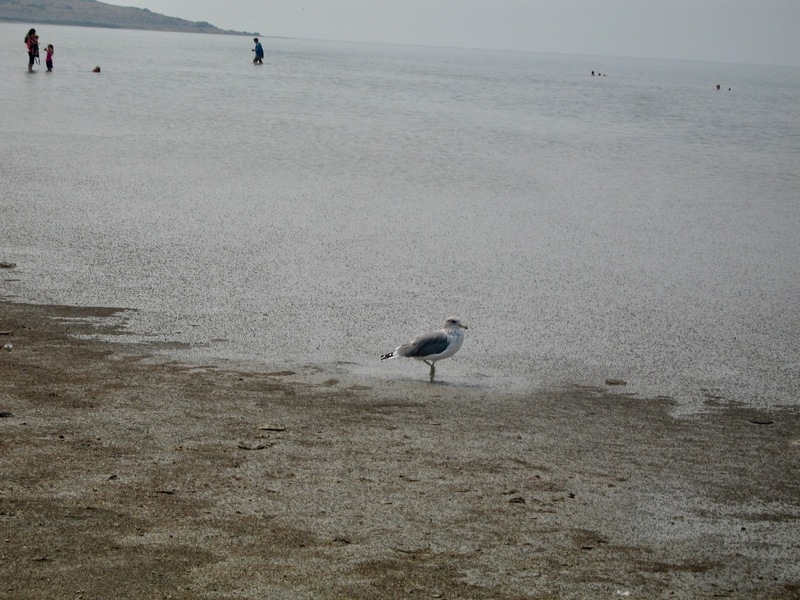 Does our state bird, the California Gull, miss the ocean and commute to the coast? Do the waters of the Bear and Jordan rivers protest against a dead end so far from the sea? 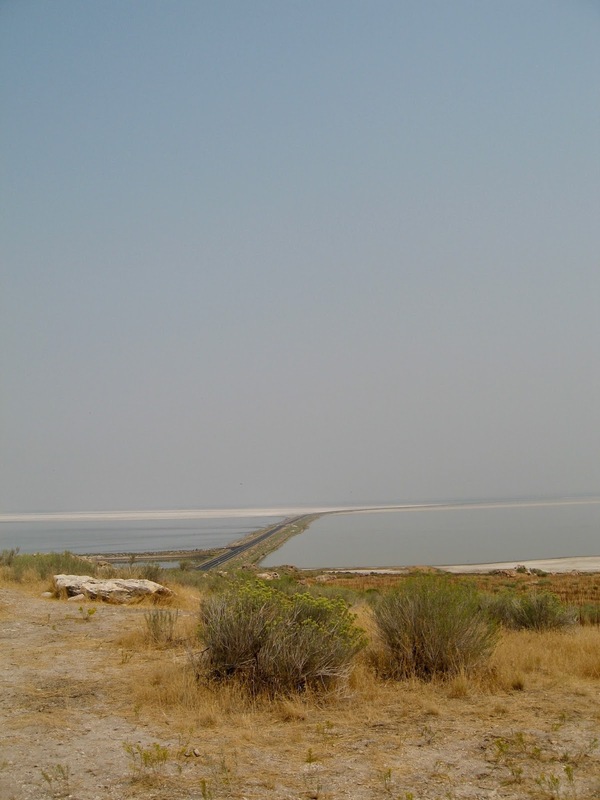 Does the Great Salt Lake long to be part of something bigger or is it content to be what it is, where it is? Can I learn to be content with who I am, where I am? Can I manage a real ocean trip soon? 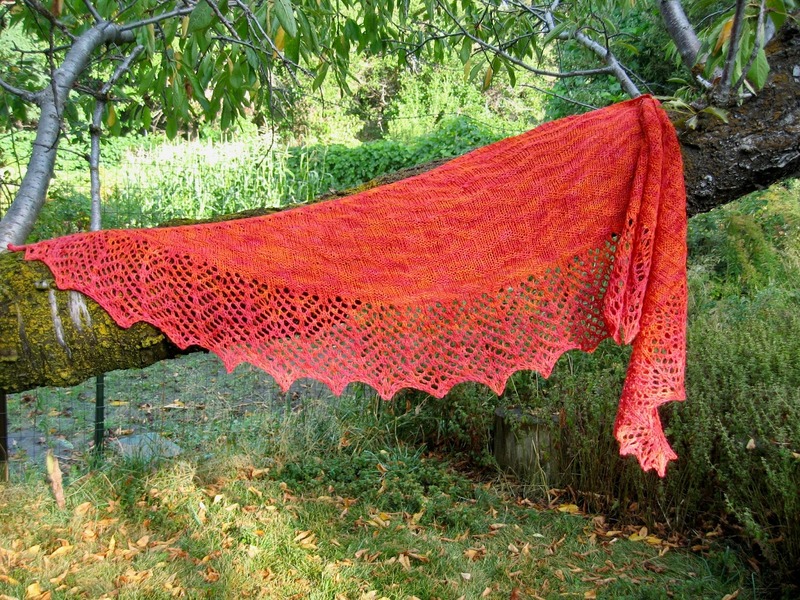 I absolutely love this shawl and will keep it for myself. The colors make me happy, which is very important, especially in January. The pattern is called Rising Sun from Soft Rainbow Design The wool is local, hand-dyed merino from Mountain Meadow Wool. I'm still working on another one in natural grey Shetland. I may keep that one too. 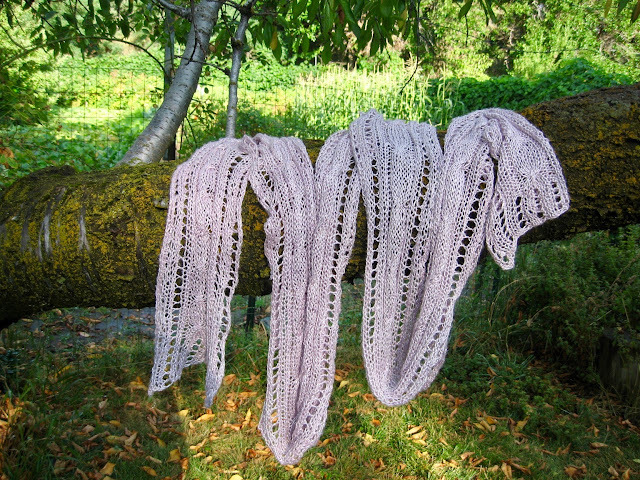 I am less certain about my other finished project, this very long scarf in very pale lavender. The yarn feels lovely. It is 100% silk spun very softly with some sparkly stuff. Silk is actually quite warm, so this will be a nice accessory for someone who can't tolerate wool. But the color doesn't move me. I can't wear it and only have it in my wardrobe because I don't do a good job sorting colors from whites in the laundry. Everyone in my house has "white" t-shirts and underwear about this shade. But I'm sure someone will enjoy it. If you know that someone, it will soon be available in my shop. 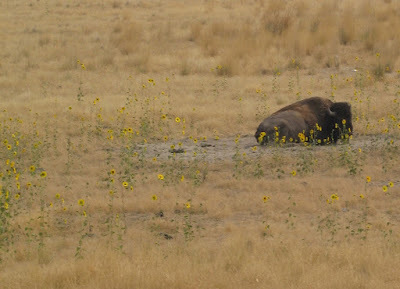 I love the pictures especially the Bison. Now I want to go. It is amazing in its own weird way, just no day at the beach. Winter hiking and camping there is quite popular once our mountains get too snowy.